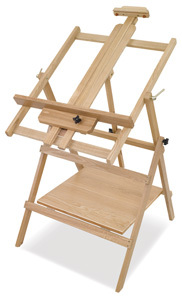 Looking for a versatile easel that can accommodate all mediums? Our Convertible Studio Easel does it all. Tilt it back to any angle for oil and acrylic painting, forward for pastel work, or configure it in horizontal position for watercolor painting and other wet media. Quick-release hinges allow for quick, easy conversion.